This paper highlights the transformative power of the HUL approach by exploring its innovative application in the City of Ballarat, Australia, since 2012. Part of the global pilot phase for the HUL, Ballarat is notable for its mainstreaming of HUL principles by local government. This has had diverse and impressive outcomes – heritage and culture have completely permeated the city’s work; new community engagement models are being developed and implemented; and many more partners of all kinds are buying in to a bigger vision about culture and identity than before. A broader cultural shift can be observed in Ballarat, and HUL has been an ‘energiser’ for others to try new things. Ballarat’s experience not only highlights how local government practice can be transformed; it predicts transformational change at other levels of government and for heritage practice itself. The list of people who have contributed to Ballarat’s HUL pilot program is extensive. We would like to acknowledge all those involved and make special mention of Dr. Ron van Oers and colleagues (WHITR-AP); Ballarat’s council officers, councillors and local community members; researchers at Federation University Australia and Deakin University and Dr. Malcolm Borg (UNGCCP); contributing consultants; Francesco Bandarin and colleagues (UNESCO); Dr. Ana Pereira Roders (Eindhoven University of Technology); and Prof. Michael Turner (Bezalel Academy of Arts and Design). Dr. Steven Cooke (Deakin University) has formed the third member of the continuing research collaboration between Deakin University and the City of Ballarat and has contributed to the reflections that are presented in this paper. We gratefully acknowledge Dr. Malcolm Borg’s generosity to include his research in this chapter. Finally, we would like to affectionately thank our fellow ‘HULigans’ who give more of themselves than anyone can imagine to operationalise the HUL approach – they’ve shared lessons and cheered on Ballarat’s efforts from all around the world – you know who you are! The authors would like to dedicate this paper to Dr. Ron van Oers decd. Ron is the sole reason that Ballarat was welcomed into an international pilot program where he gave freely to the city, passionate guidance and, personally, valued friendship. His influence is evident throughout all of Ballarat’s work. We know that we are not alone in hoping that we can carry on his substantial legacy into the future as we are sure he would have hoped. #culture2015goal [website]. http://culture2015goal.net/. Accessed 29 Dec 2017. Australian Government. (2017). Smart cities plan [website]: https://cities.dpmc.gov.au/. Accessed 29 Dec 2017. Australian Institute of Aboriginal and Torres Strait Islander Studies. (2015). Mabo case (online). https://aiatsis.gov.au/explore/articles/mabo-case. Accessed 29 Dec 2017. Australian Local Government Association (ALGA). (2017). [website]. http://alga.asn.au/. Accessed 29 Dec 2017. City of Ballarat. (2010). Preserving our heritage strategy (online). http://www.ballarat.vic.gov.au/sh/heritage/heritage-project-and-studies/preserving-our-heritage.aspx. Accessed 29 Dec 2017. City of Ballarat. (2013). Ballarat imagine (online). http://www.ballarat.vic.gov.au/haveyoursay/2013/ballaratimagine.aspx. Accessed 29 Dec 2017. City of Ballarat. (2015a). Today, tomorrow, together: The Ballarat strategy (online). http://www.ballarat.vic.gov.au/pbs/city-strategy/ballarat-strategy.aspx. Accessed 29 Dec 2017. City of Ballarat. (2015b). Today, tomorrow, together: The Ballarat strategy. Our Vision for 2040 (online). http://www.ballarat.vic.gov.au/media/3832716/40._ballarat_imagine_our_vision_for_2040_july2013.pdf. Accessed 29 Dec 2017. City of Ballarat. (2016a). Our people, culture & place. A new heritage plan for Ballarat 2016–2030 (preliminary plan). http://www.ballarat.vic.gov.au/media/3985655/preliminary_heritage_plan_our_people__culture_and_place_august_2016.pdf. Accessed 29 Dec 2017. City of Ballarat. (2016b). Imagine Ballarat east (online). Available at: http://www.ballarat.vic.gov.au/pbs/city-strategy/strategic-projects-and-frameworks/current/imagine-ballarat-east.aspx. Accessed 29 Dec 2017. City of Ballarat. (2017a). Our people, culture & place. A plan to sustain Ballarat’s heritage 2017–2030 (online). http://www.hulballarat.org.au/cb_pages/ballarat_heritage_plan.php. Accessed 29 Dec 2017. City of Ballarat. (2017b). Ballarat planning scheme (online). http://planning-schemes.delwp.vic.gov.au/schemes/ballarat. Accessed 29 Dec 2017. City of Ballarat and Centre for eResearch and Digital Innovation (CeRDI). (2014a). Historic urban landscape Ballarat [website]: http://www.hulballarat.org.au. Accessed 29 Dec 2017. City of Ballarat and Centre for eResearch and Digital Innovation (CeRDI). (2014b). Visualising Ballarat [website]: http://www.visualisingballarat.org.au. Accessed 29 Dec 2017. Edinburgh World Heritage. [website]: http://www.ewht.org.uk/. Accessed 29 Dec 2017. Global Observatory on the Historic Urban Landscape (GO-HUL). [website]: https://go-hul.com/. Accessed 29 Dec 2017. Heritage Chairs and Officials of Australia and New Zealand (HCOANZ). (2008). Supporting local government heritage conservation (Final report). https://www.heritage.vic.gov.au/__data/assets/pdf_file/0020/55523/Supporting-Local-Government-Heritage-Conservation-final-report-May-2008-.pdf. Accessed 29 Dec 2017. State of Victoria. (2006). Aboriginal Heritage Act 2006 – Sect 1 Purposes (online). http://www9.austlii.edu.au/cgi-bin/viewdoc/au/legis/vic/consol_act/aha2006164/s1.html. Accessed 29 Dec 2017. State of Victoria. (2017). Heritage Act 2017 (online). http://www5.austlii.edu.au/au/legis/vic/consol_act/ha201786/. Accessed 29 Dec 2017. The Courier. (2014). Ballarat the fastest growing city in regional Victoria (online). http://www.thecourier.com.au/story/2792437/ballarat-the-fastest-growing-regional-city-in-victoria-abs/. Accessed 29 Dec 2017. UN Habitat. (2016). The new urban agenda. Adopted at Quito, Ecuador, 20 October 2016. https://habitat3.org/the-new-urban-agenda/. Accessed 29 Dec 2017. UNESCO. (1972). Convention concerning the protection of the world cultural and natural heritage (World heritage convention). Paris. http://whc.unesco.org/en/conventiontext/. Accessed 29 Dec 2017. UNESCO. (2003). Convention for the safeguarding of the intangible cultural heritage. Paris. http://www.unesco.org/culture/ich/en/home. Accessed 29 Dec 2017. UNESCO. (2011). 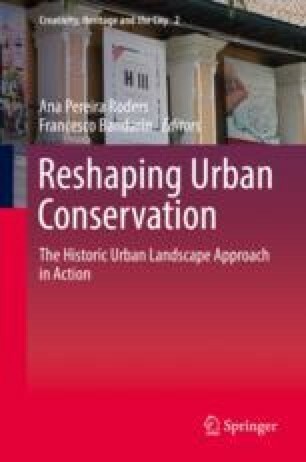 Recommendation on the historic urban landscape. Paris: UNESCO. [Online] http://portal.unesco.org/en/ev.php-URL_ID=48857&URL_DO=DO_TOPIC&URL_SECTION=201.html. Accessed 29 Dec 2017. UNESCO. (2015). [website] Culture for Sustainable Development. http://www.unesco.org/new/en/culture/themes/culture-and-development/the-future-we-want-the-role-of-culture/. Accessed 29 Dec 2017. UNESCO. (2017). States parties – Australia (online). http://whc.unesco.org/en/statesparties/au. Accessed 29 Dec 2017. United Nations. (2007). United Nations Declaration on the Rights of Indigenous Peoples (online). https://www.un.org/development/desa/indigenouspeoples/declaration-on-the-rights-of-indigenous-peoples.html. Accessed 29 Dec 2017. United Nations. (2015). Sustainable development goals: 17 goals to transform our world (online). http://www.un.org/sustainabledevelopment/sustainable-development-goals/. Accessed 29 Dec 2017. United Nations Global Compact Cities Programme. (2017). Get involved (online). https://citiesprogramme.org/get-involved/. Accessed 29 Dec 2017. Western Sydney University. (2017). [website] Circles of sustainability. About. http://www.circlesofsustainability.org/about/. Accessed 29 Dec 2017.